What is Considered in Child Support? At The Goodman Law Firm in Rockwall, we are frequently asked about child support – it’s a daily occurrence in our Rockwall law office. Child support is set by statute with many factors for the Courts to consider. For one looking to have their questions answered regarding child support, it may be helpful to read through portions of the Texas Attorney General’s website. There, they have useful charts and other information regarding child support. Child support is the legislature’s attempt to provide a financial balance for children who grow up with only one parent. Texas considers “parent” a legal term and it is the legal duty of every parent to provide for their children. The amount of child support will vary based on the number of children, the specific needs of those children (special needs/medical needs), the income of the party paying child support (the obligor), and among other things, other children the obligor may have to support. The Courts can (and will) consider most, if not all, income of the obligor – this can include overtime, bonuses, rental income, investment income, etc. 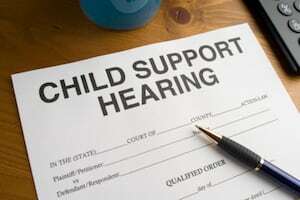 Chapter 154 is the operative section of the Texas Family Code that sets forth much of the law involving child support. Child support is typically paid by the parent who does not have primary custody. The parent who is paying the child support is called the Obligor. The person receiving child support is called the Obligee. Navigating the child support process can be overwhelming for many individuals. The Goodman Law Firm is very experienced in child support and Family Law cases and familiar with Texas requirements for child support. Please contact us today with any questions regarding your child custody situation or complete our form for a FREE case review. We serve Rockwall and the surrounding counties, including Hunt County, Kaufaman County, Dallas County and Collin County.